Apple is seeking billions over what it claims are exorbitant and unfair fees Qualcomm allegedly charged for the use of Qualcomm chips in iPhones. 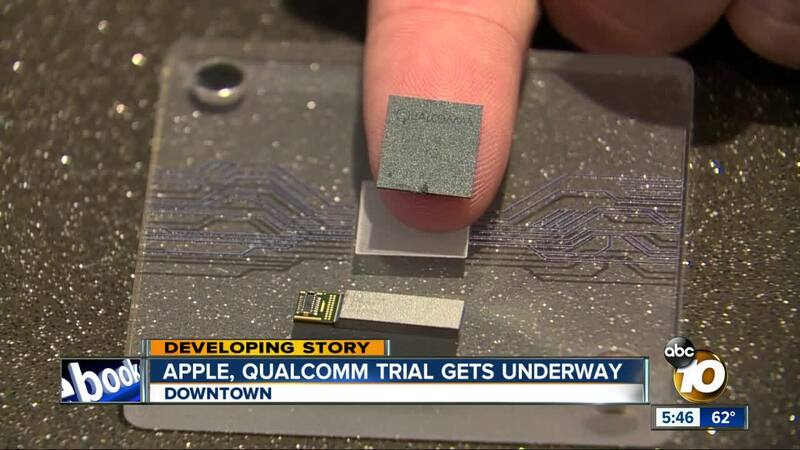 SAN DIEGO (CNS) - Jury selection is scheduled to begin Monday in a case between technology giants Apple and Qualcomm, with Apple seeking billions over what it claims are exorbitant and unfair fees Qualcomm allegedly charged for the use of Qualcomm chips in iPhones. The trial slated to begin this week in San Diego federal court is the latest in a string of legal battles between the two companies. Apple is accusing Qualcomm of charging excessive royalties for Qualcomm's hardware featured in older iPhone models. The iPhone maker says that despite Qualcomm supplying only some components used in iPhones, the San Diego-based mobile chip company has sought money based on the total cost of each phone. Apple alleges it's paid Qualcomm $7.50 per iPhone sold, when the true fee should be around $1.50 per iPhone. Apple also says that Qualcomm has withheld around $1 billion in rebates it was supposed to pay Apple as reimbursement for the patent royalties, which U.S. District Judge Gonzalo Curiel recently ruled Qualcomm was obligated to pay. Curiel is also overseeing this week's trial, and his decision regarding the rebates will not be made final until the trial concludes. Qualcomm alleges that Apple is committing patent infringement by using Qualcomm technologies that improve iPhone battery life without permission. Its claims have secured legal victories in the form of injunctions prohibiting the sale of certain iPhone models in Germany and China. Qualcomm has also faced antitrust accusations from countries around the globe, with the company fined by China, South Korea, and the European Union over complaints that it's operating as a monopoly. Qualcomm says it only withheld its rebate payments to Apple because Apple made misleading accusations to the Korea Fair Trade Commission during its antitrust investigation, while Apple says Qualcomm withheld the rebates as punishment for its fair cooperation with Korean regulators. Last month, Qualcomm won a local legal battle against Apple, when a federal jury in San Diego awarded Qualcomm $31 million in damages for Apple's infringement of three Qualcomm patents. "Today's unanimous jury verdict is the latest victory in our worldwide patent litigation directed at holding Apple accountable for using our valuable technologies without paying for them," Don Rosenberg, Qualcomm executive vice president and general counsel, said following the verdict. "The technologies invented by Qualcomm and others are what made it possible for Apple to enter the market and become successful so quickly. The three patents found to be infringed in this case represent just a small fraction of Qualcomm's valuable portfolio of tens of thousands of patents. We are gratified that courts all over the world are rejecting Apple's strategy of refusing to pay for the use of our IP." The San Diego trial is expected to last through mid-May. Meanwhile, a verdict is pending in a Federal Trade Commission lawsuit against Qualcomm for similar alleged monopolistic practices. Qualcomm's business dealings with Apple were mentioned in the FTC's court papers. stating "Qualcomm's exclusive arrangement with Apple denied other baseband processor suppliers the benefits of working with a particularly important cell phone manufacturer and hampered their development into effective competitors." Qualcomm alleged that the evidence presented in the trial "showed how Qualcomm's years of R&D and innovation fostered competition, and growth for the entire mobile economy to the benefit of consumers around the world." Closing arguments wrapped up in that trial in Northern California earlier this year, but a verdict is still pending from U.S. District Judge Lucy Koh.